Prytherch argues for the profound yet often underestimated role of streets in shaping the urban experience. Because streets are both infrastructure and social spaces, he argues the need to critically rethink the American street. He asks the questions driving the book. How exactly are streets designed and regulated, and how do these shape social and spatial relations among the mobile? What does it mean to have a “right” to the street? And what would a more equitable and just street look like, in theory and practice? 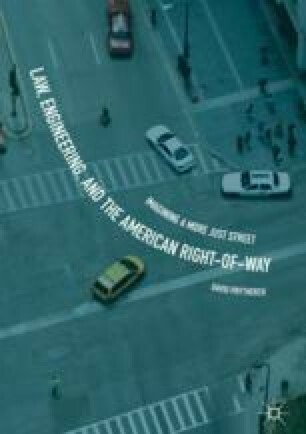 The chapter begins the book’s effort to develop a theory of mobility politics, rights, and justice on the public street, grounded in the powerful but understudied frameworks of traffic law and engineering. Prytherch suggests the need to reimagine the street, requiring at once a critical stance on the right to the street and a positive vision of what a more equitable street would look like. He hopes that the book can help comprehensively rethink the policy discourses and practices that actually produce the American street, as they are and as we might wish them to be. Streets and their sidewalks, the main public places of the city, are its most vital organs. Think of a city and what comes to mind? Its streets. Public space must be understood as a gauge of the regimes of justice extant at any particular moment. … Utopia is impossible, but the ongoing struggle toward it is not.